Baltimore, MD - January 11, 2017 - The timing was uncanny; the subject, ironic. I had initially proposed to meet Israeli-born physical security software entrepreneur Eran Jedwab at the Weinberg Park Heights JCC on Monday, January 9, shortly before noon, when a bomb threat was called in to the facility. It was one of among fifteen to nineteen Jewish community centers in at least six states that were targeted by bomb threats that day. Fortunately, four days before our meeting, I had postponed it to later that day. Utilizing Oheb Shalom and Ohr Chadash many indoor and outdoor cameras, JedEye allows you to, for example, tightly monitor classrooms and hallways. I was even able to see the tiniest of details, such as occasional litter on the floor. After Eran, founder of Jedvice, demonstrated his JedEye security solution on his tablet, I couldn’t help but think that had those threats been real—as real as the shooting rampage that murdered five people and wounded six others in the crowded Florida Ft. Lauderdale-Hollywood International Airport just three days before, lo aleinu—neutralizing the offender and evacuating the victims would have taken a different course. On Eran’s screen was JedEye’s real-time, highly automated 3-D image of Temple Oheb Shalom and its adjoining neighbor, Ohr Chadash Academy. 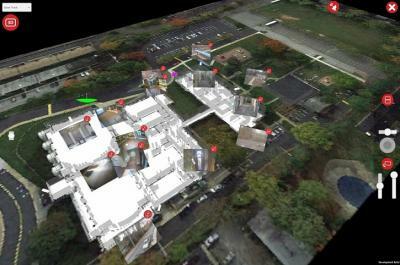 Utilizing the facility’s many indoor and outdoor cameras, JedEye allows you to, for example, tightly monitor classrooms and hallways. I was even able to see the tiniest of details, such as occasional litter on the floor. These facilities happened to have cameras already; for them, JedEye was a ”bolt-on” solution, enhancing an existing security system. BaltimoreJewishLife.com was most impressed with Eran’s demonstration! JedEye can provide improved effectiveness and efficiency in both the civilian and government sectors. In the former, it can be employed in educational institutions, places of worship, office buildings, industrial facilities, hotels, hospitals, shopping centers, airports, and stadiums, among other venues. In the latter, it can be employed in federal and state buildings, airports, ports, and nuclear power plants. It provides a new level of capability to law enforcement officers and SWAT teams ensuring tactical supremacy when these groups respond to active shooter situations. How does the JedEye security solution system differ from a security video monitor that one might have at home? Eran notes the main difference is the fact that JedEye blends the video displays and the multiple screens into a live representation of the site. An operator would have to speak a thousand words to convey an equivalent sense of what this device can give you on the ground, explains Eran, who is presently working on making JedEye cell phone-capable. The 3-D display provides perspective. It enables you to see what is happening inside rooms that are blocked from you since it gives you the capability to see through walls and look around corners. You can see what is happening and where, a valuable tool to help you respond more wisely and decisively when you are trying to locate intruders and wounded people in a facility. Coming up with innovative security solutions is nothing new for 45-year-old Eran, who has a degree in electrical engineering from Technion—Israel Institute of Technology. Before moving to Baltimore from Modi’in, together with his wife, Merav—who is a postdoctoral researcher at the University of Maryland School of Social Work—and their three children (two attend Ohr Chadash, one attends Beth Tfiloh), he was a consultant to the Ministry of Defense in Israel. He was also the Chief Supervisor for a protection program for the most threatened villages of the West Bank after the Second Intifada, a period of intensified Israeli-Palestinian violence, from 2004-2007. Intercepting the intruder was foremost on Eran’s mind when he developed JedEye, as he implemented his lessons learned from field experience with physical security systems at the most threatened sites in Israel. Jedvice was awarded Maryland Technology Development Corporation (better known as TEDCO) funds for development and deployment of a beta version of this solution at an actual site in 2015. Subsequently, Eran developed the first version of the JedEye system and had it installed at Temple Oheb Shalom and Ohr Chadash Academy. Jedvice is also a member of the Maryland Israel Development Corporation (MIDC) and has teamed up with ELTA North America, a subsidiary of the Israeli Aerospace Industries. “More than ever, our business interests go together with the community interest of employing JedEye in as many schools, institutions, and organizations here in Baltimore as we can,” shared Eran, who said it takes from days to several weeks to set up the system. “Aware of the fact that many of these facilities will be dependent on grant funding, we crafted a special offer for them, so they can adopt this system as soon as possible while we work together to prepare the portions of the grant application that express the uniqueness of this system.